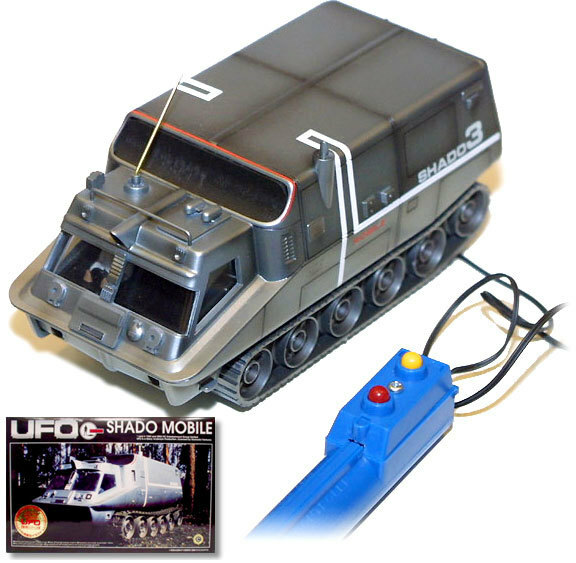 Aoshima has re-issued the classic model kit of the SHADO mobile from UFO, originally released by Imai! This all-styrene assembly kit is highly detailed and includes decals and hardwired remote control. The inner surface of the boxtop features a full color reproduction of the original packaging from the first IMAI release of this kit, complete with a beautiful illustration by Shigeru Komatsuzaki! Aoshima Re-issues the classic Imai kit of the Shadomobile from UFO! Perfect gift for the UFO fan. UFO items are hard to come by and this model has a great retro coolness to it that will bring back great memories to any sci-fi fan. Shipping was so fast that it was sent almost as fast as I ordered it. There is not many UFO Kits. This Item can easily be modified to fit my needs. Considering there arnt many budget options for the shado mobile modeller this kit fills the gap well ,easy construction nice detail , the tracks are mouded in one but with some nice weathering this is a good value kit that came out great, tip- spray body silver then spray wisp of metalic blue over top for true main colour of model .